Attorney General Faris Al-Rawi (left) greets Avni Arifi, chief of staff, Office of the Prime Minister, Republic of Kosovo on Wednesday at the Ministry of the Attorney General and Legal Affairs, Port of Spain. ATTORNEY General Faris Al-Rawi has met with two officials of the Republic of Kosovo on the issue of counter-terrorism. 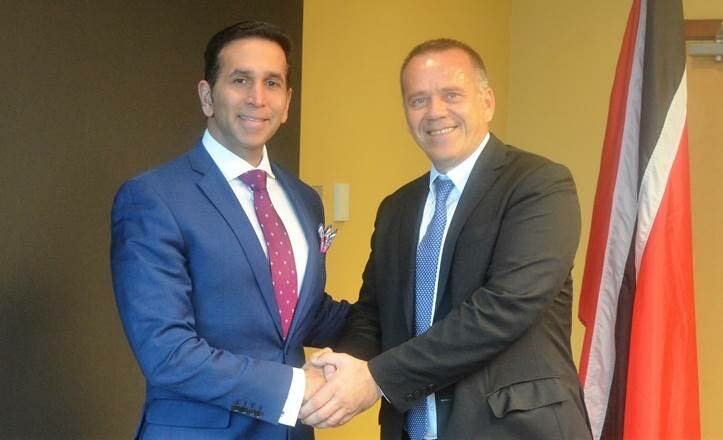 A release reported that Al-Rawi met with Naser Miftari, minister counselor of the Embassy of the Republic of Kosovo in Panama and Avni Arifi, chief of staff of the Office of the Prime Minister, Republic of Kosovo, on Wednesday for discussions on collaboration between TT and Kosovo on counter-terrorism and preventing and countering violent extremism. The meeting took place at the Ministry of the Attorney General and Legal Affairs at the AGLA Tower, Government Campus Plaza, Port of Spain. Reply to "AG talks counter-terrorism with Kosovo"